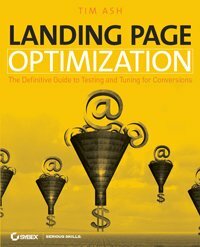 Checkout the new book “Landing Page Optimization: The Definitive Guide to Testing and Tuning for Conversions”. This was written by Tim Ash from SiteTuners.com the search engine marketing firm. This book covers the strategy and tactics of optimizing for conversions from PPC. It examines the skill-sets necessary, as well as the internal company support needed to make conversion testing a success for paid search. With pages of case studies, practical strategies, a detailed review of Google Website Optimizer tool, this one-of-a-kind resource will help you make your landing pages more profitable. Get this book now. Thanks for the link to the landing page bible. I have found landing pages essential to PPC marketing. I believe Landing Page Optimization will become the bible for Internet marketers who wish to dramatically improve their online sales. As a frequent internet shopper, I am constantly frustrated by confusing, difficult-to-use and uninformative sites even though I want to buy a product.